Frequently Asked Questions, Instructions, Troubleshooting. Why should I Choose HenSafe? Because our customers tell us it's the best! Robust, rugged and reliable, with everything self-contained in one box. We have HenSafe units in use across the world from Australia to the USA and you are buying a quality product with years of field testing. Our customers range from back garden chicken keepers to farmers, smallholders to guest houses, schools to hotels, and even a monastery. We know our product inside out and customer service is our absolute priority. Read what other customers are saying. Can I use rechargeable batteries? or can I link it up to a car battery or 6v motorcycle battery or a solar panel? You should use 4 x C-type (LR14) alkaline batteries which are suitable for motorised applications e.g. toys (look for "plus" or "ultra" or "gold" or similar on the packet) and are non-rechargeable. Any other type of battery or power will invalidate your guarantee as they may cause the electronics to fail. They should last for over a year - and you will see a message displayed when they need changing. Your HenSafe comes with a full set of instructions and a quick startup guide. You can find Setup and Display Message instructions at the bottom of this page. 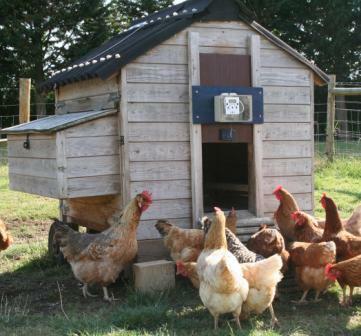 For the first few days, keep an eye out on your coop when your door is set to open and close, just to make sure you have programmed in the best settings for your location and your chickens. Do I have to take the lid off to make adjustments to the time or light levels? No. The control panel and display operate via exterior buttons so all settings and calibration are done without having to remove the lid or remove the unit from your hen house. Do I have to set the light levels? Yes. When your HenSafe leaves us the sensor will have factory settings only, so you must calibrate both light levels (opening AND closing - HenSafe stores one level for each) before switching from Time to Lux mode. Do I have to calibrate morning and evening light levels even if I only want to use one of them? How do I calibrate the Closing light level? With one push of a button! When the light level is at a stage where you want your door to close you push and hold the Manual button until you see "calibrating" on the display. When you see "OK" on the display your HenSafe unit is calibrated to start the close procedure at that exact light level: Remember that your door will close when it is darker than the light level you have calibrated so don't go out and calibrate at midnight or it won't shut! Also make sure you stand away from the unit while it's calibrating or you will cause a shadow. How do I calibrate the Opening light level? When the morning light is at a level when you want your door to open you push and hold the Manual button until you see "calibrating" on the display. When you see "OK" on the display your HenSafe unit is calibrated to start the open procedure at that exact light level: Remember that your door will open when it is lighter than the light level you have calibrated so it's no good calibrating at mid-day. Also remember to stand away from the unit when you calibrate so that HenSafe can see the ambient light properly. So how do the light levels work on the "Both" setting? ﻿After you have calibrated the morning light level and the evening light level you can use the Both setting. When you close on Both your door will close when it is darker than the calibrated light level and later than the set close time. When you open on Both your door will open when it is lighter than the calibrated light level and later than the set open time. What about when the clocks change for Summer Time or Daylight Saving? However, we recommend that you change the actual time of day (the clock setting) which then means of course that you will need to change the open and close times (if you are using Time or Both to open and close) in the same direction, as they will be one hour out of kilter. How high will HenSafe lift my door? Our cord will give you a maximum travel of lift of approx. 600mm. If this is not long enough/high enough you can extend the cord by adding a length onto the cord supplied. Will I have to alter the length of the cord to match my hen house door? No, it is fully automatic: HenSafe works by sensing weight on the cord to operate and the motor will stop when your door reaches the bottom of its run on closing, and when it reaches the top on opening. Can I use HenSafe if I have Ducks? Yes! However, ducks generally do not put themselves to bed. You need to set a closing time of, say, 23:00 and pop out any time before then to use the Manual button to close your door, having ensured your ducks are safely away. HenSafe will open next morning with the Open settings which you have set. Remember that if you are opening on Lux you will still need to calibrate a night time close Lux, even though you are not using it, so that HenSafe can distinguish between morning and evening light levels (see above). Can I Keep Ducks and Chickens Together? Yes! Ducks and chickens will live side by side quite happily. You can keep them in the same enclosure or environment but they should have separate, rat-proof and fox-proof houses. Ducks don't need perches and tend not to use nesting boxes but they do need at least 2 square feet of floor space per bird. You don't need a pond but they do enjoy a swim and a splash so you'll need to have a large plastic container that you can fill up for them with water so they can bathe and keep clean. Remember to change the water regularly to keep it fresh. Ducks also like greens to eat, especially in winter, and will love eating your garden insects. Actually they will love eating your garden - so beware! 2 years. However the guarantee does not cover the cord, battery failure, misuse, fair wear and tear on the label and casing, your hen house, your door, your hens. Please click here to register your guarantee. What about repairs and servicing outside of guarantee? We offer a repair and service for your HenSafe on a 48 hour (usually less) turnaround. All HenSafe parts are replaceable, at a fraction of the price of a new unit. Please contact us for details. We take pride in excellent customer service and our reviews speak for themselves. How do I fix HenSafe to the chicken coop? By using the bracket supplied and hanging it on a nail, hook or a screw, vertically above your pop-hole. It is 165mm wide x 125mm high x 75mm deep, plus the metal mounting which is an extra 15mm high. 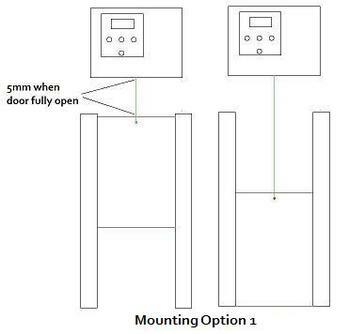 Mounting Option 1 below shows how to fit HenSafe to your coop. I want to mount HenSafe at the side of my pop hole, so can I add pulleys and a longer piece of cord? It is possible to add an additional piece of cord to extend the length of the cord supplied, and then to arrange pulleys to mount HenSafe at the side of your pop hole. Please ensure that whatever pulleys you use that the cord enters HenSafe vertically. Remember also that additional pulleys will cause rubbing points though, so you'll need to check the cord routing regularly for chafing. A better way would be to use Mounting Option 2 which you can see at the bottom of this page. Can I fit HenSafe to a hinged/ramped door? No. We would recommend you fit a vertical sliding door. A hinged door may trap debris and there is a danger it might not shut properly. There are usually ways of fitting a vertical door without having to remove your existing ramped door. Can I fit HenSafe to a horizontal sliding door? No. We recommend to our customers that they fit a vertical sliding door. Some coops allow you to fit a vertical door as well as (on top of) a sliding door. You would need to fit 2 runners either side of the hole and then fit a vertical sliding door between them. Can I fit HenSafe to a Plastic Coop? Yes, provided it has a vertical sliding door. Do check the weight of your door - HenSafe needs a minimum of 500g door weight to operate. Anything less than this may cause intermittent opening. On a new coop, once you place it in position it will undoubtedly settle on its base/legs and start to shift (especially on softer ground). This may cause your door and runners to run out of true from the vertical and your door may start to stick in its runners without you noticing - the first thing you will see is that your door has not closed to program. If this happens you need to double check that your door is free to drop on its own without help, and ideally add some extra weight to your door. Just hang something onto the nail/hook/screw where the end of the HenSafe cord loop attaches to your door. That should solve the problem. HenSafe will work with a door weighing up to 5Kg so there's plenty of weight to play with! Yes it is weatherproof. We have units across the world in very high (Australia) and very low (Scandinavia) temperatures. There is of course a small hole in the bottom of the unit where the cord enters so if you are pressure washing or painting your coop then please remove your HenSafe before you do this. There isn't enough room above my pop hole to mount HenSafe, what can I do? You could fit a back board over the front of your vertical door runners and then attach the HenSafe cord to the bottom of your door using a small spacing block just to ensure the cord remains vertical. See Mounting Option 2 below. 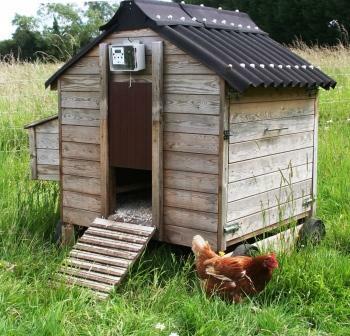 Yes - buy HenSafe with a remote light sensor, especially useful for customers with walk-in chicken sheds with separate pop-holes, and also for customers who have the most beautiful chicken coop in the world and who want to keep its aesthetic lines. Mount your HenSafe inside your coop or shed, then simply poke the end of the 1m cable to the outside through a small hole which you make in the side or front of your coop. This cable has a light sensor on the end which sees the ambient light levels. If 1m of cable isn't enough then we can add more for you for a small charge - just ask us. Can I fit HenSafe to my door which runs up the inside of the coop? You can fit HenSafe with your door as it is, provided it runs freely up and down. You would mount HenSafe on the outside of your coop and attach the cord to the bottom of your door as in Mounting Option 2 below, using a spacer block to ensure that the cord enters HenSafe vertically. HenSafe operates on weight. Your door must be absolutely free-running in its tracks, hanging on the cord and able to drop on its own. If no weight is sensed then your door will not open and close properly. Sometimes this happens when a door gets stuck in its runners on the way down and then it won't shut completely. If it sticks on the way up then the cord may snap - the cord is the weakest point by design, so that no strain is put on the unit itself if this happens. Check that your door and runners have not warped and that your door has a minimum weight of 500g. You can always add weight to your door by hanging something onto the nail/screw/hook that attaches the cord loop to your door. Check the display regularly when you go out to check your birds and collect eggs. Check in warmer and wetter times that your door and runners have not warped and are still running freely and vertically. Check that your hen house is level and that one side hasn't sunk which might cause the runners to twist. Check that your open and close settings are still appropriate for your location and when the seasons change. My door keeps sticking in the ice and mud, what can I do? Try putting a small screw vertically into the bottom of your door, so that when the door closes it comes to rest on the screw head and not on the whole length of the bottom of your door. There is then only one point at which the door can stick if it becomes icy. Always ensure that the door is able to close completely if you do this, with no gap for predators to find. My HenSafe has stopped working! Help! OK, firstly re-familiarise yourself with the instructions. If yours are not to hand, use the contact page and we can email you another set. Check the actual time of day - which will need updating if you have changed the batteries. Check the mode for opening and the mode for closing is what you expect: Time, Lux or Both. Have you inadvertently changed something while programming? Double check! Remember that if you use Lux for opening or closing, you must calibrate an open level AND a close level, even if you are only using one of them. Do the batteries need changing? There will have been a message on the display screen. Check the battery connection and that all batteries are seated well into the battery carrier box. Check that the wiring loom is plugged firmly into the base unit and the lid. Check that your door is absolutely free to drop and raise within its runners with no sticking or jarring. If the cord has broken: Is your door stuck in its runners? Is there ice and mud frozen at the bottom of your door? (you can buy new cord from us via our Shop – please only use our cord!). If you retie your broken cord, make sure it's still long enough and that you have tied the knot and the loop correctly - back page of your instructions or see below. Check the cord routing - back page of your instructions or see the photo below. Is there a message on the display screen? Refer to your instructions for how to clear it. If you have a remote light sensor, is it free of mud? Can it “see” ambient light properly? If all of this is OK, go back to basics: Set your HenSafe to open and close on Time. If this works OK, recalibrate the open AND close light levels to use on Lux and/or Both modes. If you still have a problem, use the contact page and we will help you! Scroll down for setting instructions and display message solution downloads. Lastly, please remember that owning a HenSafe is not a substitution for daily welfare visits to your chickens. Full instructions are provided on purchase. You just need to make sure that there is enough room above your pop hole to mount HenSafe, allowing for a minimum of 5mm clearance between the top of your open door and the bottom of HenSafe. If you are short of space, use mounting option 2 below. If you are short of headroom above your pop hole then use this option. 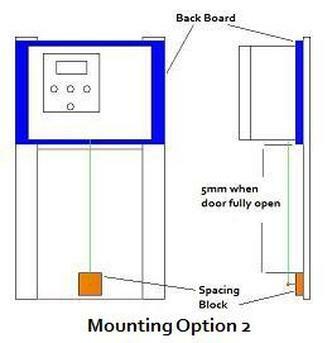 It involves mounting a back board onto the front face of your door runners (shown in blue below), attaching the cord to the bottom of your door with a spacing block (so the cord enters HenSafe vertically) and raising the door behind the back board. You will need to have a minimum of 5mm clearance between the top of your open door and the bottom of HenSafe. Full instructions are provided on purchase. 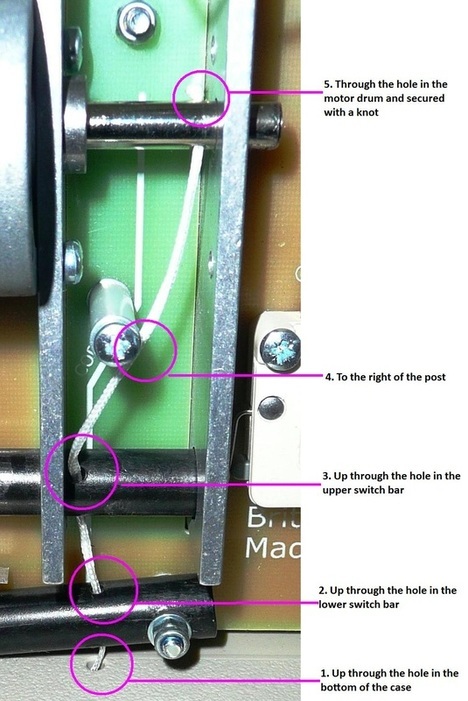 If you need to replace the cord, this photo shows how to thread the cord up through the bottom of the case to achieve correct routing. After you have done this you need to continue with your printed instructions (supplied on purchase) on cord replacement, i.e. making the loop, tying the knot and winding in. * Download the Instructions for Settings (Time, Lux, Both, Manual Button) here. * Download the Instructions for Display Messages & Cord Change here.